The sub-assembly hierarchy of AGC p/n 2003100-021 is listed below. Minor sub-assemblies and individual components that appear in the drawings but are not listed below may appear in our master engineering-drawing index. 2003056-011, POWER SUPPLY MODULE A30-31, expanded in more detail below. 2003169-011, ALARM MODULE B8, expanded in more detail below. 2005028, SCHEMATIC. Note: Drawing 2005028A has been transcribed into CAD files (see the explanation), which can be found in our CAD schematics repository. There is also a folder of visual renderings of those CAD files as images. 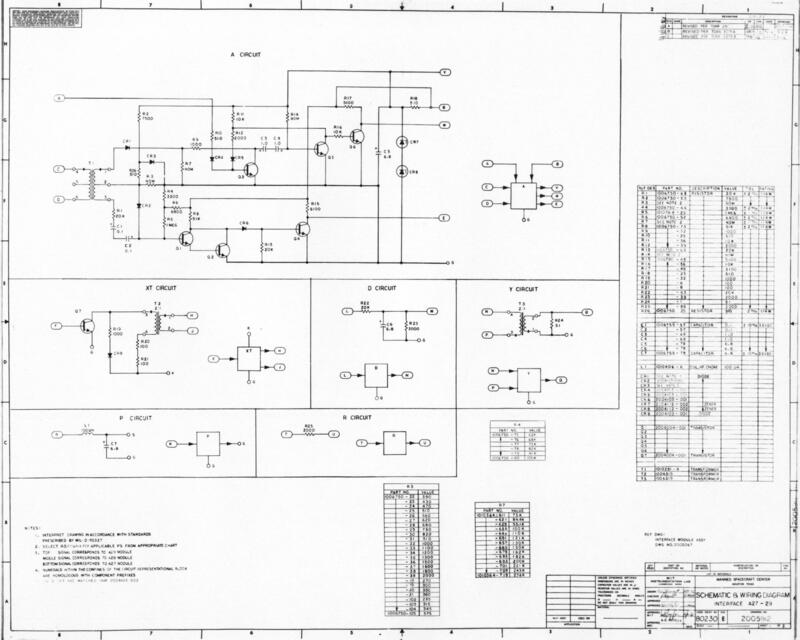 2005010, SCHEMATIC. Note: This drawing has been transcribed into CAD files (see the explanation), which can be found in our CAD schematics repository. There is also a folder of visual renderings of those CAD files as images.